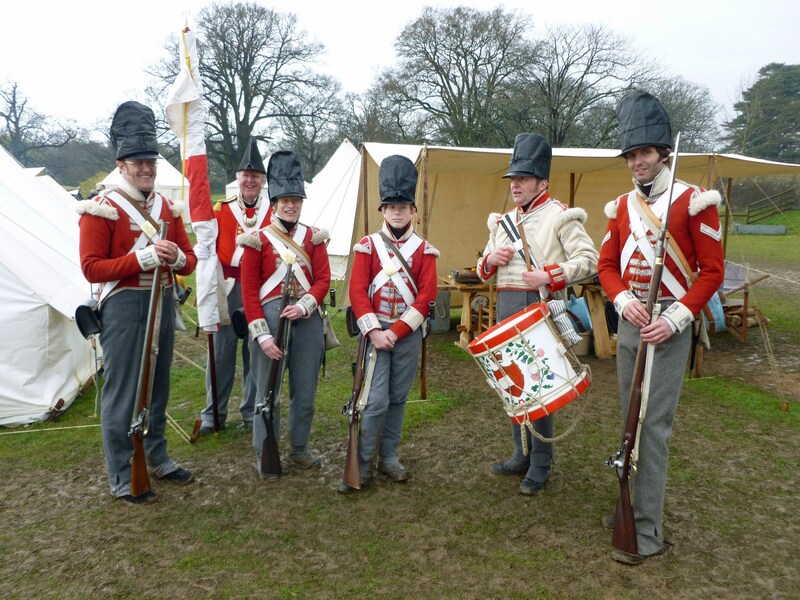 And so to the first Napoleonic Association (NA) event of the 2016 season – Ickworth House near Bury St Edmunds in Suffolk. Ickworth is a fantastic National Trust property with magnificent Georgian Manor House, great facilities and plenty of open, rolling, parkland – ideal for camping, parading and ‘fighting the French’! Hosted by the 3/95th and attended by numerous other Regiments, the 32nd were represented by Wendy, Sue, John, David (the younger), Nigel, Eddie and Bob – plus Peter and Jerry with the Artillery. Arriving at Bury St Edmunds on a cool but dry Friday afternoon, our camp was successfully erected before the weather took a significant turn for the worse. An overnight temperature of approx 4 degrees on Friday night turned to heavy rain in the early hours of Saturday morning with the camp site rapidly taking on the character of a ‘quagmire’ as the day progressed. 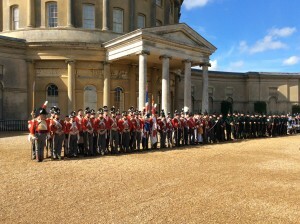 Fortunately the rain eased off sufficiently during the middle of the morning to enable us to form up and parade as a Brigade – providing some very brave members of the public (amazing the number in view of the weather) a General Salute in front of the iconic dome of Ickworth House. 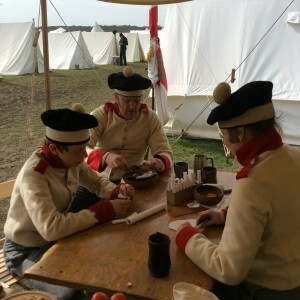 A brief period of Brigade drill followed in preparation for the planned skirmish across open parkland later in the day, before further heavy rain brought about an early break for hot tea, ammunition-making and lunch. At 14:30 the weather gods smiled on us once more, the rain stopped (just about!) 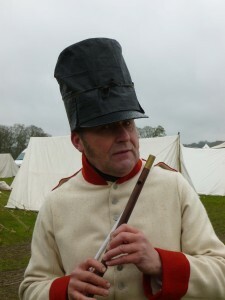 and we formed up and marched far out into the Ickworth estate to take on the French. After what appeared an unpromising start – attacking the French from the bottom of a hill – our weight of fire eventually forced their withdrawal from that position of strength. For the next hour and a half we continued a game of ‘cat-and-mouse’ constantly advancing, outmanoeuvring and firing volley after volley into our retreating foe. With great good fortune (surely our senior officers couldn’t really have planned it that way!) the rout of the French was completed just outside the entrance to our camp site – making for a quick fallout and return to camp before the rain set in again. Our most significant challenge was however yet to come. After yet more delicious hot food created by our multi-tasking marvel, Sue, and a very convivial evening supping port around an open fire the rain clouds melted away, bright stars came out and the temperature plummeted. Thank God for sleeping bags (except for those who forgot theirs), multiple blankets, Great coats and several pairs of socks! It was COLD!!! Then along came the positives! Crawling out of our tents at 07:00 Sunday morning we were greeted by a stunning morning – bright sunshine and clear blue skies. The white frost, the frozen fire buckets, the ice on the awning were all quickly forgotten (or, perhaps, just melted away!). Even some of the thick sticky mud began to dry out! Another hero, Eddie, was again up first, lighting the fire and getting our breakfast underway – the world was again a most fantastic place to be in. The Sunday timetable followed much the same pattern as Saturday (except it remained dry and bright!). 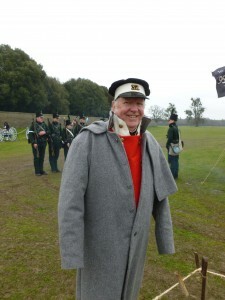 Brigade parade was followed by Brigade drill and then it was back to our Living History camp to meet the public and prepare once more for battle with the French. Drum-major Edwards and Ensign Birtwhistle also used the opportunity to practice our ‘recruitment patter’ on the unsuspecting public. Our vigorous announcements and entreaties to join the 32nd were attentively received but, unfortunately, the ‘men of Ickworth’ generally seemed unmoved! However it was fun to try and certainly brought more attention to the 32nd. Finally it was time once more to face and tame our French foe – this time in the main arena at the back of Ickworth House. With a large crowd cheering us on, we overcame a ‘sticky’ start when forced to retreat for the first time over the weekend. This was however short-lived and soon we pushing the French back across a raucous and smoky battlefield and were soon able to declare victory for Wellington and King George! A great weekend with a smart, well led and increasingly ‘professional’ team who are fun to be a part of. Now, not only do we have the best camp followers in the business, but we also have the best musician as a full time member of the team. Thanks to all for making it happen.